This year's Festival will once again feature some of Scotland’s finest chefs and food and drink producers showcasing their skills and products in South West Scotland in the heart of an area renowned for its high-quality food production and natural beauty. Enjoy the delights of a huge selection of artisan and award-winning produce from over fifty stalls - including street food, local food and drink. We’ll also be celebrating World Gin Day all weekend with over 100 gins available including the launch of the new limited edition Ballantrae Gin. 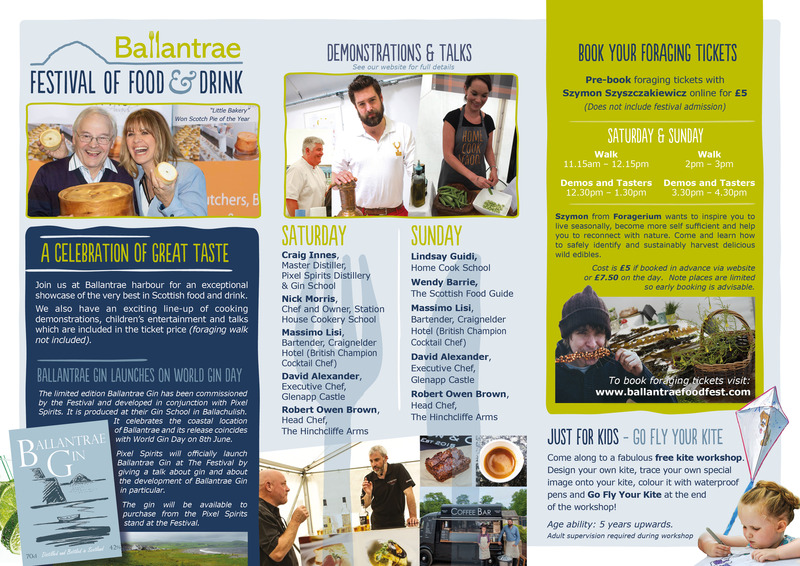 On both days there will be an exciting line-up of cooking demonstrations, workshops, talks and tasting sessions - included in the ticket price - with live music throughout the day. There will also be an opportunity to take part in guided foraging walks (small additional charge). Marquees in the stunning setting of Ballantrae shore with its views of Ailsa Craig and Arran provide the backdrop. Free kite making workshop for children. It's sure to be a fun day out for all the family! !